In response to floods in the Plains and Midwest caused by rapid snowmelt and heavy rains, American Baptist Home Mission Societies, on behalf of American Baptist Churches USA, has launched a One Great Hour of Sharing campaign to raise much-needed funds for victims. Volunteer to help rebuild, restore, renew and bring God’s healing love to families and communities across the United States mainland and Puerto Rico. Nothing brings light to a child’s eyes more than toys at Christmas. Many of the children of Puerto Rico are still living without electricity, so their homes and schools are especially in need of the light of God’s love. With Annual Session behind us, we are ready to enlist your help as together we begin to make a difference in the many lives that have been effected by so many hurricanes this season. Hurricane Sandy Response - Awesome Deeds of Righteousness! ABCNJ and our American Baptist partners are making a difference on the Jersey shore (and beyond)! The third of four Hurricane Sandy Relief work weeks, sponsored jointly by ABCNJ and the American Baptist Home Mission Societies, is coming to a successful close. Volunteers from New Jersey (ABCNJ), Pennsylvania (ABCOPAD), Indiana (ABC Ind/KY), Rhode Island (ABCORI) and West Virginia (WVBC) are among those participating - 94 in all! As Executive Minister and Senior Regional Pastor of ABCNJ, I am so proud of how our region and its churches have responded to the storm. We have repaired and rebuilt buildings, and more importantly, have served our communities in countless ways.These work weeks demonstrate that we are not alone - the entire ABCUSA family is alongside us! And we are making a difference in the lives of families along the shore and beyond. Folks keep letting us know how much they appreciate what the volunteers are doing. I had the opportunity to visit some of the work sites on Tuesday (August 16), accompanied by Victoria Goff (ABHMS), Denise Gratzel (ABCNJ Disaster Relief Coordinator) and Mark Mahserjian-Smith (ABCOPAD). This has been an extraordinarily hot week, but that has not dampened the enthusiasm of our volunteers. Each day they keep on serving! Our Hurricane Sandy Response volunteers are involved in many activities, including painting interior walls of homes damaged by the storm, cleaning up and beautifying yards, hauling debris from homes (like refrigerators! ), preparing a community center for future relief activities, and preparing the building adjacent to ABCNJ's Pilgrim Baptist Church, for future ministry. But it is not just the physical labor that is touching peoples' lives. Our volunteers have also been listening to the stories of and then praying with those they are helping. Many have been through so much trauma and they deeply appreciate a listening and compassionate friend. As I reflected on what is happening in our midst, I was led to read Psalm 65. In verse 5 and 7, David exclaims: "You answer us with awesome deeds of righteousness, O God our Savior, ...who stilled the roaring of the seas, the roaring of their waves." This week, I witnessed the "awesome deeds of righteousness" of God's people in response to the storm of a century, and from their actions, God's grace and love brought a measure of peace and consolation to those whose lives have been tossed about. Looking to the future, we still have a work week scheduled for August 10-17, 2013. In 2014, we hope to sponsor two more work weeks. We have a wonderful Team consisting of volunteers from Pennsylvania, Maryland, West Virginia and Illinois. They have been busy working on two of our ABC , one in Rahway and the other in Red Bank. Rahway suffered water damage and the church had to put on a new roof due to Hurricane Sandy. The other is a home where volunteers will be housed when they come to serve. The jobs included sheet rocking, painting, ceiling tile replacement and the removal of moldy insulation. The delicious dinners were provided by local churches and church members. The only complaint volunteers have had is the weight gain, so don't come prepared to loose weight. We'll make you sweat but you will not loose weight . FBC Manasquan, Pastor Joe Gratzel worked very hard with church members and town officials to have two showers installed in time for the week. Outings included a visit to Seaside Heights board walk and canoeing. If you are considering serving God in NJ though one of our two work weeks left, please register early. Because of the huge interest so far we are considering stopping registration at 100 volunteers per week. July week is in Manasquan area again and August week we will be in Atlantic County , south Jersey. We will close registrations for both weeks two weeks before that work week starts. May God bless you as you prepare to come join us Rebuild , Restore and Renew the Jersey shore areas. The first of this year's work weeks to help rebuild the Jersey shore and other areas in our state is underway. Here are some pictures, from Pilgrim Baptist Church, Red Bank. American Baptist Home Mission Societies (ABHMS) is searching for a Marketing Director for its Publishing Ministry, Judson Press. ABHMS and Judson Press (Organization) need a qualified individual to establish and implement sales and marketing strategies for Judson Press products. These include religious print and e-books, periodicals and merchandise. The Marketing Director reports to the Publisher of Judson Press. This is a full-time position and is open immediately. See the link below for more information (link will open a PDF). I want to share with ABCNJ friends and family about the ABC Asian Conference and Asian Caucus Convocation at the First Baptist Church in Waltham, Massachusetts, August 20-22, 2012. Our theme was Challenges and Opportunities for Asian and Asian American Churches. I was the representative for ABCNJ Associate Regional Pastorfor Asian Ministries and First Asian Baptist Church, Haddonfield, NJ. Our region was represented by my church (11 people - 4 adults and 7 teenagers.) and Evergreen Baptist Church in Teaneck, Rev, Joshua Pyon(1), First Baptist Peddie Memorial Church, Newark, Rev. Felix Tingson and Lay leader Felix Colinco, Calvary Baptist Church of Clifton, Rev. Manual de la Fuente and his daughter, Catherine. The Keynote speaker was Dr. Russell Yee, Author of Worship on the Way (Judson Press 2012). Yee is an ordained American Baptist minister on the pastoral staff of New Hope Covenant Church (Oakland, California). Another guest speaker was Dr. Sydney Park, One of the editors of Honoring the Generations: Learning with Asian North American Congregations. (Judson Press 2012). Park is a biblical scholar and assistant professor at Beeson Divinity School in Birmingham, Alabama. We had a wonderful fellowship, and testimonies and track discussion and all different ethnic group discussion and Judson side tour etc. This brought all the Asian pastors and lay leaders and families together giving a challenge on how to make a difference and outreach in understanding to the next generation. Since 1972, the American Baptist Home Missions Societies hosts the National Gathering of American Baptist Youth conference every four years. 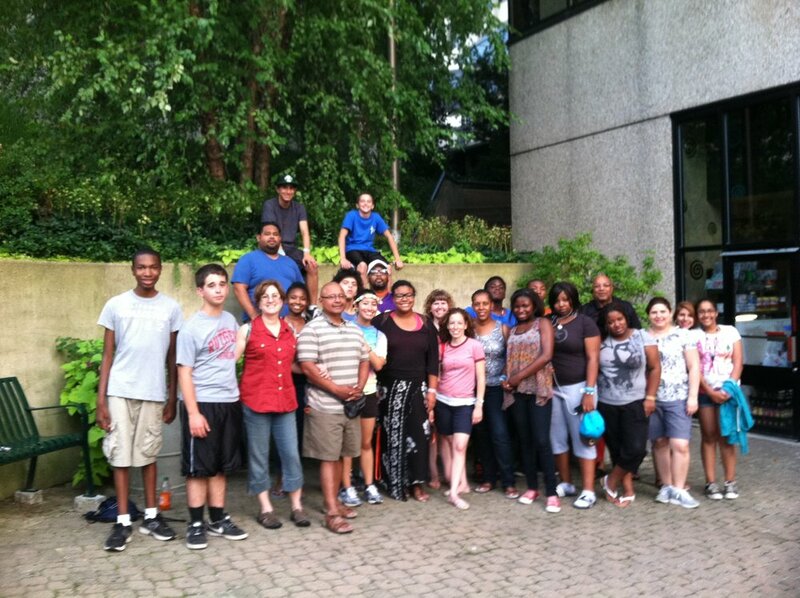 IMMERSE 2012 was held on the campus of American University in Washington D.C on July 24-28, 2012. The conference theme was based on Romans 12:1-2 (MSG). The goal of the conference was to mobilize and engage American Baptist Youth to be disciples and leaders in their church, school and community. ABCNJ had a delegation of almost 50 youth and youth ministers/leaders attend the conference. Regional churches represented at the conference were: Evergreen- Teaneck, FBC Kenilworth, FBC New Brunswick, Shiloh –Trenton, FBC- New Market, FBC Westfield and Mt. Zion-Newark. The delegation participated in daily worship, speaker presentations, small group discussion, back home small groups and dorm devotion. The highlight of the conference was two days of mission outreach in the Washington D.C. area. The ABCNJ delegation assisted the elderly with light food shopping and errands, gleaned collard greens for families in poverty, and fed children in the City Gate’s summer program. The second day of the conference was dedicated to advocacy. A panel discussion provided the attendees with a broad array of opportunities to put faith into action. The panel consisted of community service agency leaders to recent mission trip participants. The region’s Reverend Ty Choate, pastor of the FBC Red Bank, was one of the participants on the panel discussion. After the panel discussion the conference attendees participated in a Prayer Walk on the National Mall in Washington D.C. The day of advocacy ended with a powerful worship service encouraging the conference attendees to be a catalyst for change in their church and communities. At the end of the worship service almost 200 youth accepted Jesus Christ as their personal savior and while others rededicated their life to a deeper relationship with Jesus Christ. The last day of the conference ended with an inspirational commissioning service which charged the youth and youth ministers/leaders to be ‘the hands and feet of Jesus Christ’ in their church, school and community. Praise God for a wonderful, enriching and powerful conference.